Weatherboard cladding, sometimes known as featheredge cladding, is traditionally made from a timber tapered board that is layered thick end over narrow end, meaning that at points on the wall there are two layers of cladding. Weatherboard cladding is normally fixed horizontally. 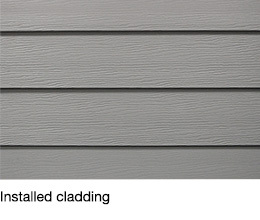 Today Weatherboard and Shiplap Cladding is available in wide variety of colours and profiles. These are designed with the look and feel of wood, often with an embossed finish, but give a low maintenance and long lasting alternative to timber. Receive a £10 M&S voucher when you send us a photo of your cladding job!